It is widely understood that we need a raise for teachers. 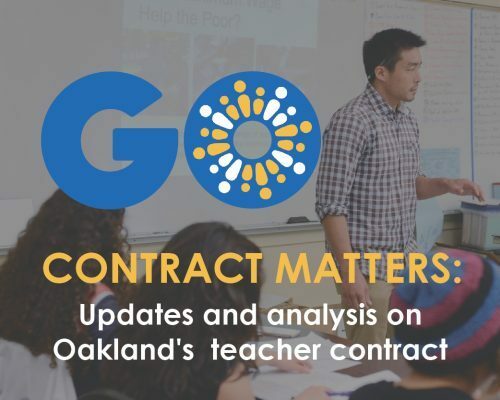 As a community, we have under invested in the teachers for years and the current contract negotiations between the Oakland Unified School District (OUSD) and the Oakland Education Association (OEA) provide an opportunity to change that. The issue remains how much of a raise and when. For a great primer on teacher salaries check out “Who Stays In Teaching and Why” (see Ch 4, pg 37-44). 1. Prioritize new state funding: OUSD’s state funding is slated to increase every year from now until the 2020-21 school year. Of this increase, how much should be applied to teacher raises? We will be receiving more money in the coming years due to (1) an improving economy, and (2) the passage of Local Control Funding Formula. LCFF provides more funds for districts like OUSD with high levels of student need. For the funds we receive due to our student population, we must “increase or improve” programs, services, and outcomes for high needs students, but there will also be new funding that we can use more broadly. How much of that should fund teacher salary increases? This increase in state funding also has some strings attached. In June 2014, the state passed a law that raises district contributions into the state pension system. When the law was passed, the district contributed 8.25% of compensation per year, but by 2020 this will increase to 19.1%. This will result in over $15 million dollars per year of state-mandated costs to the district. Measure G: Measure G states that, among other things, its $20 million is to be used to “to attract and retain highly qualified teachers.” In the 2013-14 school year, there was about $3 million in Measure G funding not used to address retention issues or to reduce class sizes (see Measure G report). If used in its entirety, this could fund a 2% raise, but that would mean eliminating the art, music, and library positions and programs it currently funds. Reduce administrative salaries: Many people have asked about top administrative salaries. According to 2013-14 data, cutting the top 30 OUSD salaries by 33% would create a 1% raise for teachers. We will share more information on this, but wanted to share a sense of how much money was actually at stake in this area. Reduce personnel: The district could cut the number of district accountants. But if we cut too many, the district will lose far more money in additional audit findings and see more mistakes like the ones that caused the school sites to have to redo their entire site budgets. Comparing OUSD to other Districts: Do we know how OUSD compares in terms of infrastructure, salary levels, etc.? If not, how does central office know if it is doing a good job? We noted above that we were giving examples, rather that suggestions. Ideally, these priorities should be determined by a budget process that makes it easy to identify our priorities and by criteria that help us to know whether certain programs are working. We do not currently have that budget process (click here for an example of one). Share 2-3 scenarios that propose different tradeoffs to fund larger raises. Ultimately, we need to think long-term. Our salaries have to be higher than just competitive because of the combination of a looming teacher shortage and the fact that Oakland teachers face more challenging conditions. To do so, we need to have a broader community discussion about the steps we’ve taken so far and where we’re willing to act to go further for our teachers.